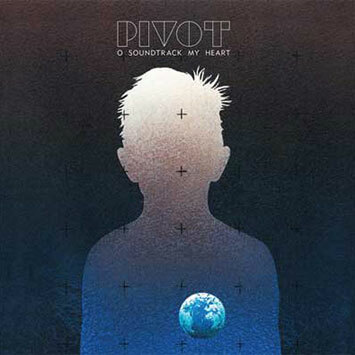 Energetic 'puzzle pop' trio from Australia, Pivot, release their long playing debut on Warp. 'O Soundtrack My Heart' is a colourful mix of spikey guitar riffs and vigorous, synthesized melody in abundance. Features the infectiously catchy single 'In The Blood'. In our spare time we've decided to get into home-made podcasting. It's under the amazingly-clever title 'O Download My Heart'. We've gone through our record collections and picked a theme for each episode. First themed episode was 'Cosmic Gods Of Synth'. The second episode is available now: 'Australian Music'. You can subscribe to it in iTunes (we recommend this), or use other types of feed readers by putting in this URL - pivotpivot.net/podcast/odownloadmyheart.xml.. And the good news is that it's free. Originally formed in late nineties Australia, Pivot have until recently remained hidden from the international radar. With their first album released in 2005 (the locally acclaimed 'Make Me Love You') multi-instrumentalist brothers Laurenz and Richard Pike sensed it was time for new things. The addition of Perth born/London-based Dave Miller in 2006, and the subsequent departure of the original line up, sparked a period of intense creative activity, resulting in a new band, a new album and dreams of the beyond…. Pivot are a rare combination of the emotive and cerebral, harnessing the raw garage energy of three explosive musicians along side intensive studio production. Part prog-warrior, part slacker-geek, their music and approach provide something much needed in a world of nowhere music (being listened to in nowhere bars), Equally influenced by synthesizer luminaries Vangelis and Jean-Michel Jarre, Warp label mates Autechre and the post-punk new wave of Talking Heads, Pivot's Warp album debut O Soundtrack My Heart exudes an omnipresent sense of melodrama and what can only be described as a sort of 'apocalyptic joy'. With incredible live shows and the "slacker-nerd grooves" (Time Out) of debut Warp EP In The Blood already impressing the so oft cynical UK press corps, O Soundtrack My Heart is ready to win yours too.